After all the excitement with litters of pigs over the last few months, it’s now time to think about the cattle and get ready for calving again. The last time they calved we missed the actual event but were on hand within an hour or two to check on both mother and new-born calf. Our calculations for calving dates this year are based entirely on the dates for the bulls visit last year and their level of interest in him at different times during his stay. 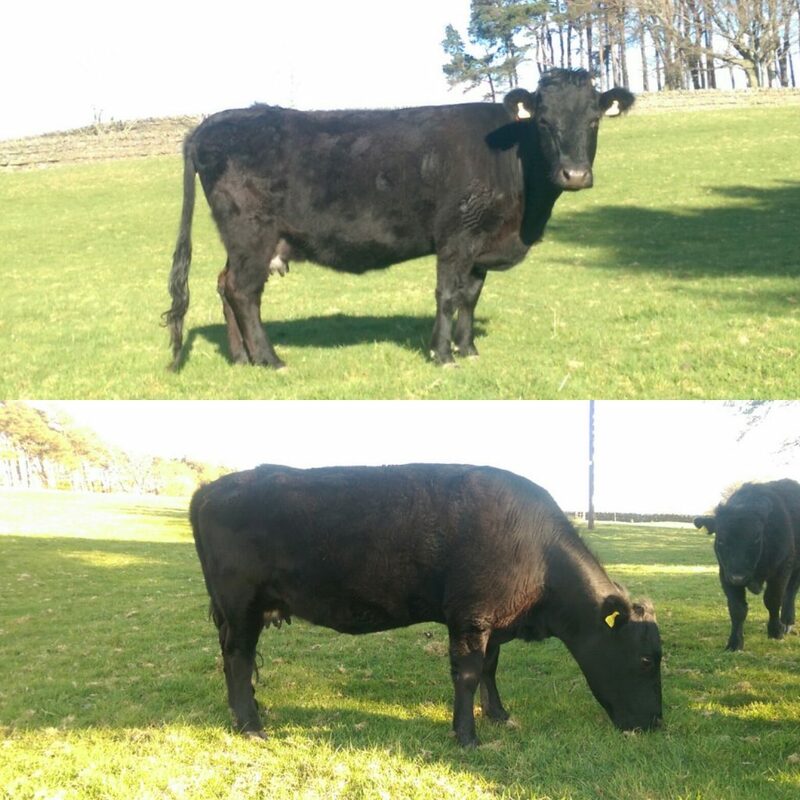 Apparently the usual gestation period for cattle of 283 days can be out by as much as 7 days (earlier or later) but I’ve calculated the dates as being 26 May for Nellie and 7 June for Daisy. A good indicator that calving is getting closer is how the cows body changes in preparation for the event. The first visible signs were a noticeable increase in udder size on Nellie who is due first when compared with Daisy who should be almost 2 weeks later. We could have had a vet in to check/scan them in the early stages just to confirm that they were in-calf but we decided that made no difference to our plans. If they both had calves that would be great but with just 2 cows this is still a bit of an experiment for us. It won’t be the end of the world if it turns out one of them wasn’t in-calf but I hope that isn’t the case. Our top concern for the moment is having somewhere with enough grass for them to eat while still being secluded enough to offer a little privacy for calving. For the last few weeks all 4 Dexters have been out in the front fields to give the back fields a chance to recover a little from the rough treatment over winter. A stay in the front fields is always a bit of an adventure for them and they have enjoyed exploring the furthest corners over the last few weeks. 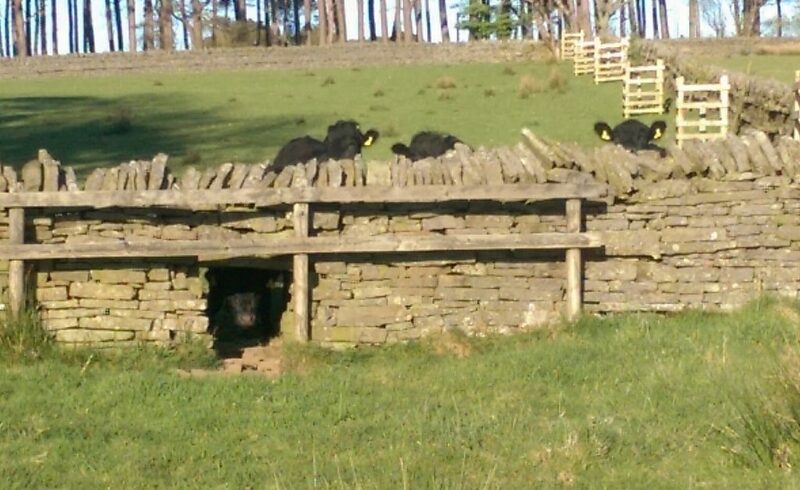 As the picture below shows, even the youngest calf – Elvis – enjoyed himself despite still being a little too short to see over the walls in places. Luckily these old dry stone walls have “smoot holes” which are designed to allow sheep to pass through. A lesser concern for me is whether to separate the current calves – Oscar and Elvis – from the herd before the new calves appear. There is a slight worry that their occasionally more boisterous behaviour could be a problem when the new-born calves appear or even that the 2 cows might be a little over-protective. I think we’ll just have to wait and see how that goes but I’m certainly going to have a plan in mind if it becomes necessary.